Getting clean dishes just went high-tech. Saving energy with your appliances has become a national pastime lately, with high-efficiency (HE) washers and dryers more popular than ever. 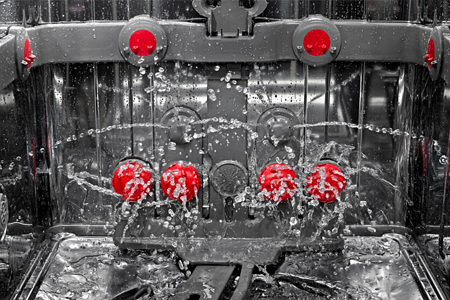 Not to be left behind, dishwashers have forayed into the energy savings arena. Dishwasher in need of repair? We service all major brands. SmartWash HE Cycle from Kenmore automatically adjusts the water and energy use to the size of the load and the amount of cleaning needed. Less water and less energy for smaller loads means more savings for you. AquaSense Recycling from KitchenAid uses water left over from the last rinse cycle. It sounds ghastly and potentially smelly — dirty water lying in wait for your next batch of dishes — but it’s neither of those things. And rest assured, it uses clean water for the final rinse. As a result, you’re using up to 33% less water overall compared to our most efficient model without AquaSense™ Recycling System, based on EnergyStar.gov published water usage. TurboZone Reach is a top-rack wash feature from Kenmore that puts the power of 24 spray jets to work blasting your dishes clean. SmartDry, also from Kenmore, selects the dry time appropriate for the matching wash cycle. SmartDry uses a heating element, plus a system of vents and a fan on the side of the tub to ensure effective drying for all items. There is also an optional cycle, SmartDry Plus, which adds more drying time. Rotating, independent spray arms. Several dishwashers have rolled out this feature. Kenmore’s PowerWash technology reaches deep into the corners to blast dishes clean, and its TurboZone with rotating spray jets use six pressurized spray nozzles that target stubborn, stuck-on residue. Frigidaire’s OrbitClean has the traditional spray arms and another rotating sprayer, to cover a wider area. And Samsung’s WaterWall system includes a bar of vertical jets instead of spinning arms, designed to catch even the dishes wedged into the very back of the upper rack. Ultra Wash HE filter from Kenmore traps food particles and keeps them from re-entering the water and sticking on your dishes. Cleaner water, cleaner dishes. Sanitizing Rinse Cycle, also from Kenmore, removes nearly 100% of bacteria on your dishes. MicroClean, another Kenmore feature, is a high-speed rotating inlet filter that shortens wash cycles and lowers energy and water consumption — without sacrificing powerful performance, says Mike Showalter, a field support engineer for the product engineering group at Sears. “It eliminates customer interaction by not having to manually clean the filter,” he adds. Zone Booster, from Samsung lets you target areas for a higher-pressure, hotter wash. Bottle jets. Tired of trying to get baby bottles or sports water bottles clean? Problem solved by GE’s bottle washer jets. Place your bottles over the jet, and you’re good to go. High-tech options. Lots of appliances are going “smart,” and dishwashers are no exception. Whirlpool’s 6th Sense Live syncs with your Wi-Fi to smarten up the machine. It monitors when energy consumption in your area is the least expensive and programs itself to run during those times, saving you money in the process. Customizable racks. Many brands, including Kenmore and GE, are making their racks customizable depending on what you need to wash. Lots of tall pots and pans? Move the top rack up a few inches. A slew of glassware? Arrange the tines so they all fit. 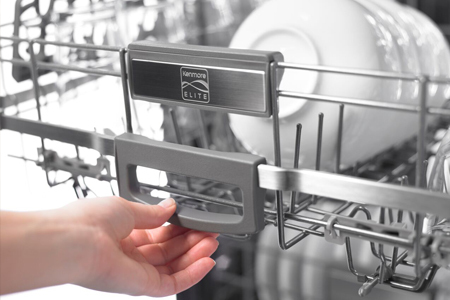 Another feature dealing with the racks: Kenmore’s Elite’s upper-rack-only cycle for when you’re washing something delicate, perhaps, like your fine china teacups. Which dishwasher is right for you? Time to start shopping! Find the perfect one for you and your home here. Ready for a new dishwasher? Explore Kenmore, Whirlpool, Samsung, and more.